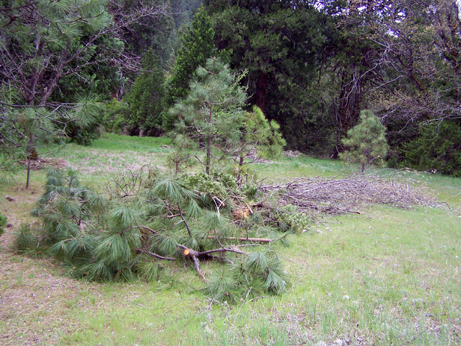 A week ago, at least a dozen pine trees were cut down in our yard. D. and M. left the debris scattered all over the meadow, for James and me to clean up later. 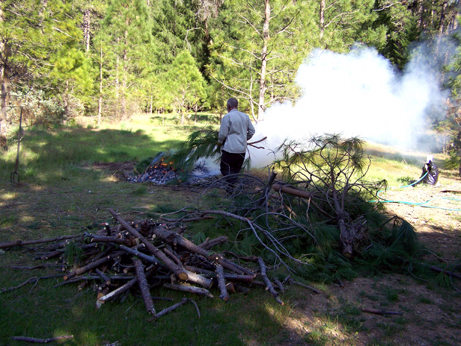 Since the burn season officially ends on May 1st — after which it is necessary to get a permit — we decided to burn the many branches scattered throughout the meadow last Saturday, before conditions became too dry. I played with the Modesto Symphony Wednesday through Friday, while James completed his interior painting project at the family house in Sacramento. We stayed there for three days, then I had two days free before having to perform the final kiddie concert in Modesto. So we decided to come home on Friday afternoon, were able to spend all day Saturday and then return to the valley on Sunday. It was a lot of driving, but we really wanted to be HOME — even for such a brief time. 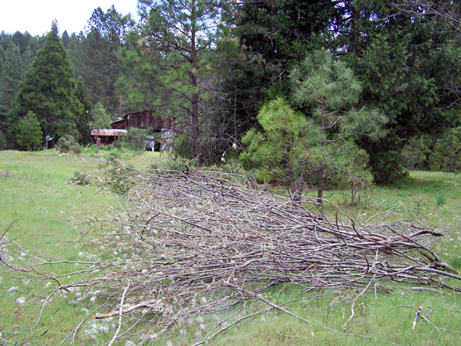 Shortly after noon on Saturday, James went out to the meadow with loppers and began trimming the branches off the usable tree trunks for kindling and small starter firewood. Pine is good for this, because it’s soft and fast-burning in the Franklin stove. Later, oak or other hard wood is added after the fire is well established. I joined James with another pair of loppers and our work began in earnest. There were four large piles of debris to deal with in the side-meadow. We soon amassed enough branches to haul off to the burn pile, so James drove the pickup truck into the meadow and loaded it while I continued to lop off branches from the next tangled heap of limbs. Most of the locals would not save any of these branches and might laugh if they knew that we were doing this, but we feel strongly that it’s our obligation to save as much of the tree as possible, after cutting their lives short. We placed the burn pile near the well, so that we would be as close to the water source as we could get. 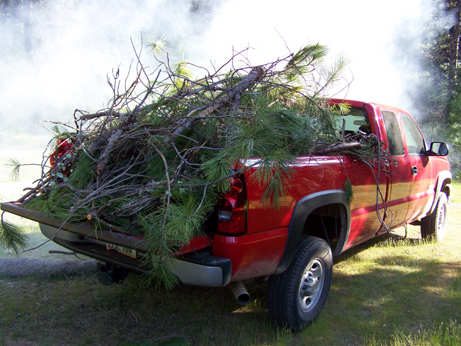 When the fire was roaring and crackling with the green pine branches, it became my job to tend it while James continued to load the stacks of greenery from the meadow into the truck. Hauling. Chopping. Tossing branches onto the fire. Adjusting the branches on the burn pile. More hauling, chopping, tossing etc. The non-stop cycle continued for hours. It turned into a meditation, and time floated by in billows of fragrant smoke. At last, the sun was about to set and we were down to chopping up the last pile of branches. Whew. We put in a seven-hour day. We sat in our folding chairs near the burn-pile and contemplated the mountain of coals, which looked like a miniature city on fire. 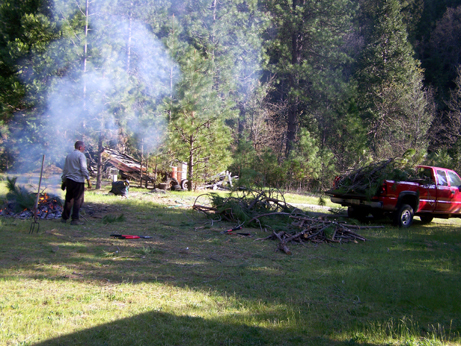 James joked that we were indulging in a redneck activity, settin’ ’round the burn-pile faahr watching sh** burn. Wellsuh, guilty as charged I guess. My muscles ached from the unaccustomed labor. James is in a bit better shape because he does more physical work on the land, but said that he ached too. My thighs and lower back growled a protest from all that bending and lifting. But it felt really good to work outside on that lovely sunny mild afternoon in early Spring. It was beneficial for both body and soul, and we’d like to think that we made the best of the tree-cutting situation. Here’s a video of the crackling fire. If you listen closely, you might hear James sighing a time or two. We worked hard that day! Now there are piles of the larger trunks still residing in the meadow, that need to be cut up with the chain-saw and then stacked in the barn to dry out over the next six months. Only one pile of green branches remain to burn. I don’t know if we’ll make the May 1st deadline; we’ll probably have to get a permit to burn the rest, or wait until Fall. 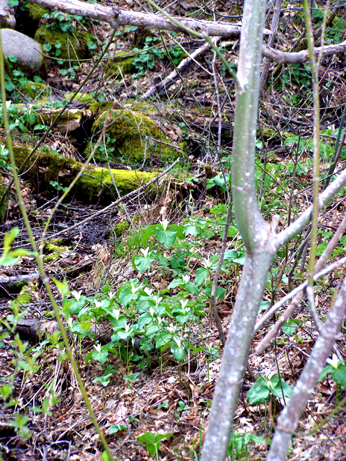 In the following picture, branches from a dead willow tree are in the foreground. James plans to use these to create a lattice-work effect in combination with mesh screen for our proposed Summer Kitchen. We will remove the outside wall and replace it with support-beams and a screen. The wall is practically falling down anyway! We invited our dear friends L. & D. to come up from Nevada City to visit us on the land today. D. promised to bring along not only his chainsaw, but also a close friend who also has an even better chainsaw and truly enjoys doing forest-work and is apparently an expert at it. This was too good an offer to pass up. Actually, we hug our share of trees and cherish them, yet…there is a need for occasional thinning of the ranks, which are so numerous on this particular piece of land that we’d never live long enough to cut them all down, should we be so inclined — which we’re not. The trees are truly a blessing on this land, and we are awed whenever we walk amongst them. But as most people who are intimately connected with forestry know that some of them need to be thinned. We don’t want to be excessive about it, but we DO wish to preserve this meadow in all its open glory and magnificence. Quite a few pine trees have sprouted up over the past dozen years, some growing too close to our electrical wires, and others which obstruct the view down towards the river. Many of these fifteen-to-twenty-foot tall trees are not healthy, showing many branches of brown pine needles, which can happen when they grow too close to their neighbors. And we sure can use the firewood! Never again will we need to PAY for firewood as we did last Fall, when it was too late to gather a winter supply. Now we have the time, and there are certainly enough felled trees to keep our trusty-rusty Franklin stove burning for years to come. Note: Many of the downed trees all around this land are harder wood (oak, cedar) which burn best in the stove. But it is nice to be able to start fires with faster-burning, softer wood such as pine. Rest assured, we will keep a close watch on the chimneys to make sure that creosote doesn’t build up too much. L. & D. and D’s friend M. drove up from Nevada City shortly after 10 this morning. The skies were overcast and the breeze was cool. Rain was imminent, so we needed to get started cutting as soon as possible before it got wet. M. was a marvel at cutting the trees. His chainsaw was indeed powerful, and he prides himself on keeping its blades sharp. As you can see in the following video, he wasted no time felling the trees. When it came time for a break, James served a wonderful lunch of hot butternut squash soup, salad and garlic bread on a folding table overlooking the meadow in the quickening cool breeze. Then the guys went to another part of the meadow to thin out more dying trees before they left — just moments before the rain blew over the mountains. So that was our Chainsaw Massacre on Earth Day. We bless the trees, again. We trust that the Spirits of the Pine understand. Ever since we moved out to The Woods last summer, we’ve discussed cutting down some of the small pine trees which surround the barn and outbuildings. We bought a chainsaw awhile back but hadn’t used it until today. I think that both of us were hesitant to operate it because of the danger factor. We donned our work gloves, and our special hard orange hats with protective screens for the eyes and headphones for the ears. James read all the directions carefully and fired ‘er up. The first cut was a branch growing at a weird angle from the base of our liquid amber tree out front (which you may recall from last Fall’s photos). After several pulls of the starter rope, the chainsaw came to life. I had expected something louder and more dramatic, but the gas-powered machine was not quite as scary as I’d imagined. However, both James and I have a healthy respect for the chainsaw’s power, and we need to be extremely careful and mindful while operating it at all times. James approached the liquid amber tree. Zing! The saw cut through the large branch “like buttah”. “Let’s go out back and try it on a couple small pines!” James exclaimed, so we walked out back to the meadow. He cut down a twenty-foot tall tree which was probably ten years old, and trimmed off a few branches before letting me cut off the rest. Then I cut the trunk into eighteen-inch sections for firewood. I was relieved to find that I could manage the chainsaw with ease, but I refuse to be lulled into false complacency or confidence. We absolutely have to be careful. I think the real danger will come after using it a while, when the tendency to relax may creep in. James suggested that we always operate the chainsaw together, which is a good idea. Although it is sad to cut short a tree’s life — a new experience for both of us — as long as we do this in a conscious way and give thanks for the firewood, we will feel all right about it. I know that might sound strange, especially to our local friends who cut down trees on a regular basis. But we wish to live as lightly and consciously on this land as possible. After cutting down another tree and stacking the wood in the barn, I went back into the Music Room to finish tuning my harp. I was amused at the juxtaposition between harps and chainsaws; how diametrically opposed those two objects are! That’s a big part of the fun of living here — the extremes. …then James happened to take a picture with nearly the same angle, several days later! 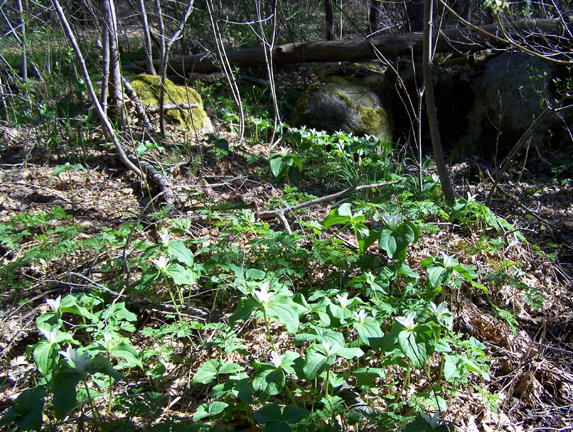 A few days later, James was exploring the area of the property southeast of the barn, which is a good quarter-mile uphill from the river. 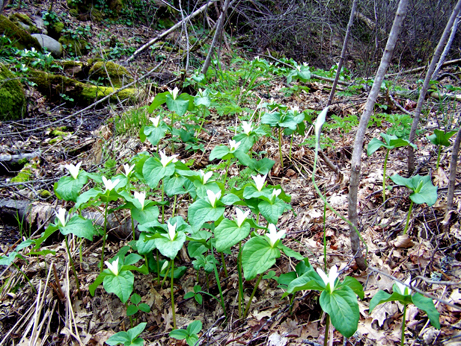 He discovered many more trilliums growing in the woods. Have any of you WordPress habitués ever gotten the error message, “You are posting comments too quickly. Slow down.” ? I have tried posting comments on several WP blogs today and that very strange error message came up each time. It’s not like I’m rapidly firing off comments left and right, blazing away at the computer keyboard til smoke rises from it, my eyes popping out of my skull as I frantically dash off fevered messages to everyone’s WordPress blog. And the admonition “Slow down.” At least they could say “Please”! It all sounds so cold. 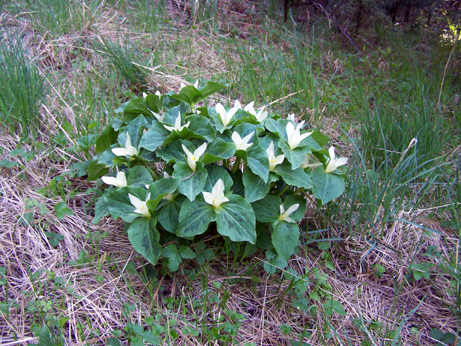 Up here in the mountains, Spring is “springing” gradually. 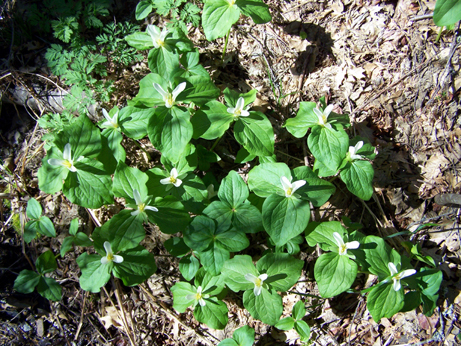 The new season is deliberate in its unfolding, unlike the valley where it tends to burst out with an explosion of sudden color and invasion of pollen. Little by little on this land, the flowers are starting to bloom. 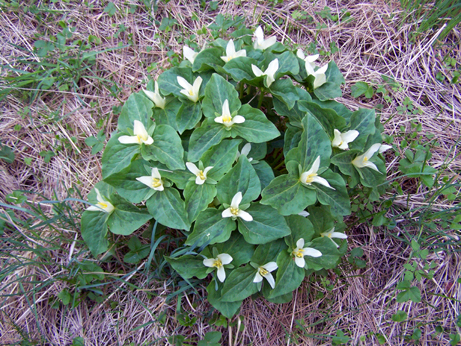 A couple weeks ago, it was a lone dandelion nestled bravely in the middle of the meadow and a couple of tiny violets in the side-yard. Now these are joined with a few others. Baby’s breath is making its first appearance. 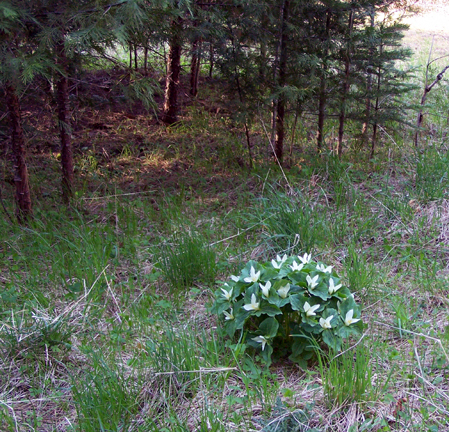 Down by the river is a very interesting flowering plant which James and I were not familiar with. 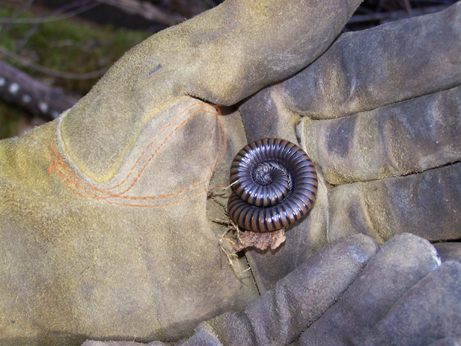 I emailed this picture to D. (our dear friend L.’s partner) in Nevada City who identified it. 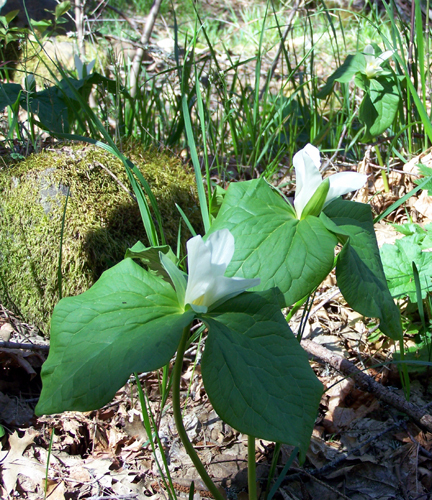 Of course, it’s a trillium. Fascinating flower. It is relatively rare in this country, and is in fact illegal to pick in Michigan, New York, Oregon and Washington, along with British Columbia. 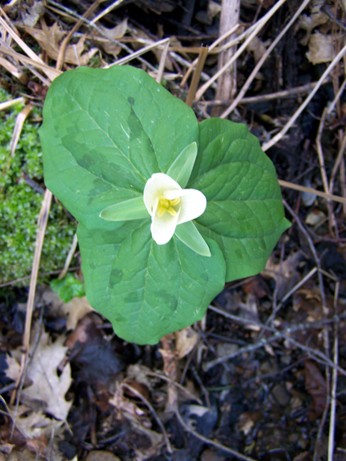 It is the designated flower of the province of Ontario, featuring prominently on the Franco-Ontarian flag. 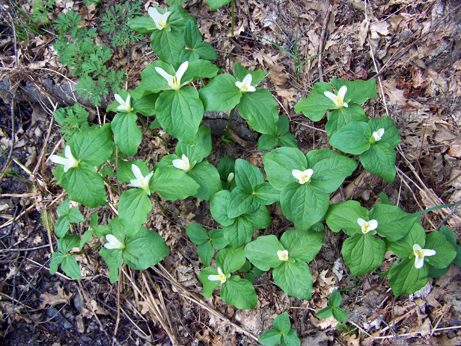 There are easily a hundred of these plants growing on our land, first encountered on the new trail that we have been blazing through the tangled blackberry bushes, then in more concentrated clumps along the tiny creek near the river. 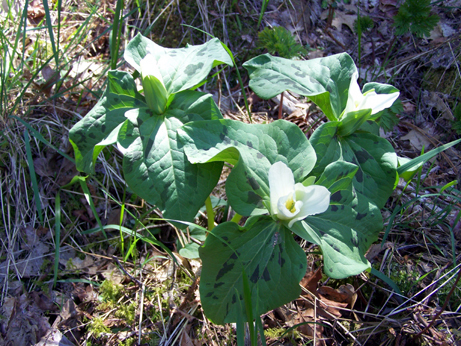 Some have begun to bloom, but not all have done so yet. 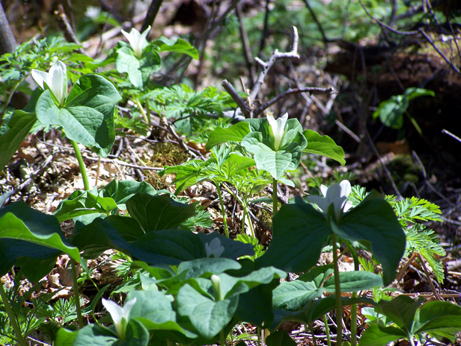 We walk the trail each morning to check on the progress of the flowers, and trod carefully around the trilliums growing in the middle of the path. The plants are extremely fragile. 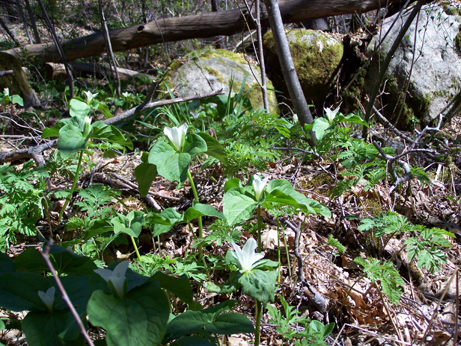 I will post a picture of the trilliums in their glory when more bloom. 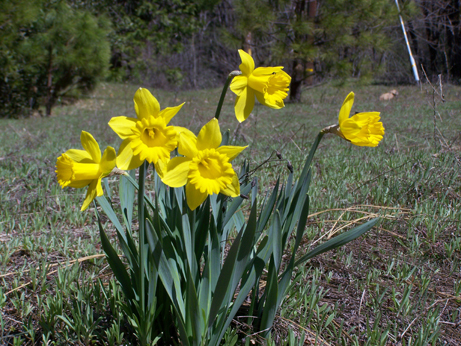 L.’s daffodils are now in full bloom at the bottom of the meadow, near the path leading down to the river cabin. They are such beautiful, yet delicate flowers, so intimately associated with the coming of Spring. 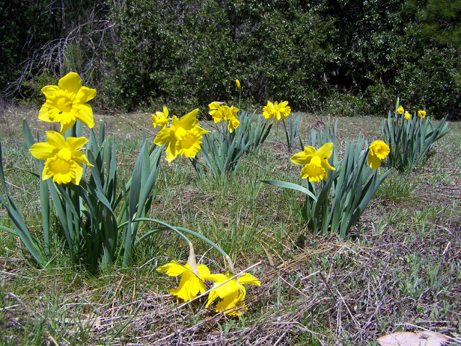 The weight of the brilliant yellow petals at last bends the stems earthward. 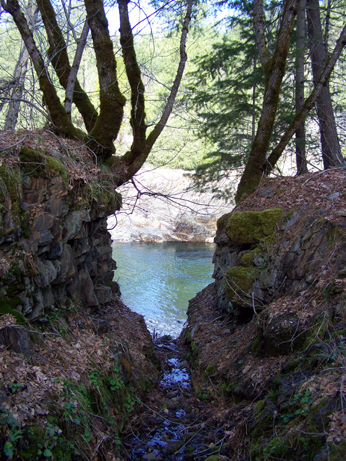 Our new trail leads down to the creek which trickles down to the river (seen in the last post’s ladder waterfall). I love this picture; it is so inviting. I can hardly wait for summer! Trees grow along the cliffs near the river entrance. 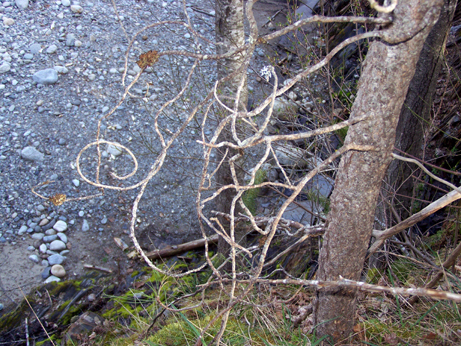 James had me take this shot of the branches swirling in interesting patterns. The perspective is misleading; the gravel in the background on our private beach is actually about twenty feet below the camera! The sound of the rushing water is so soothing. For risk of waxing too eloquent, yet again — we are so very blessed to live here! I must continue to express my thanks as often as possible, because I never, ever want to take this for granted.